Fox’ Bar and Restaurant Review: Fourteen, 14 Benjamin Franklin St.
Fourteen is an English-owned bar new on the Bucharest night life scene which opened its doors in October 2009, and I have to say, what a little gem! Situated at Strada Benjamin Franklin 14 just to the side of the Athenaeum, it is a basement bar club run by a very friendly and welcoming team of bar staff serving up good wines, cocktails and a selection of draught and bottle beers, including Newcastle Brown Ale, which makes me feel right at home! The bar has a cosy feel with its exposed red brick walls and soft lighting, ideal for an early evening drink, with bench seating and tables along the walls playing background tunes. As the evening progresses the tunes are gently rev’d up playing a mixture of 80′s, Brit pop with a few of your favorite anthems in the mix. This is a great venue for a private party if you want to invite 80 of your best friends. 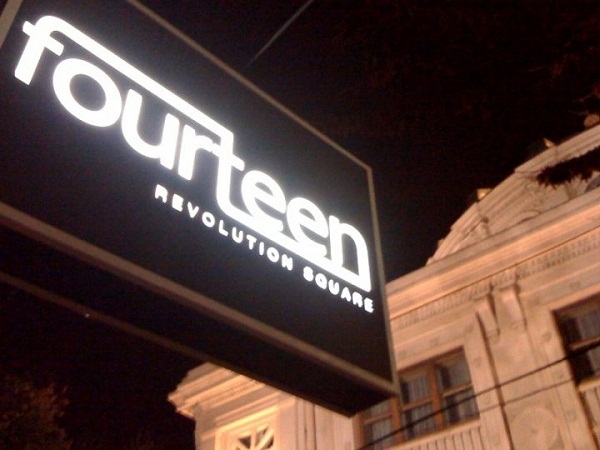 Fourteen is open from Tuesday ‘till Saturday 7pm until very late.